The White Swan Tavern has been a familiar landmark in Chestertown since pre-Revolutionary War days. 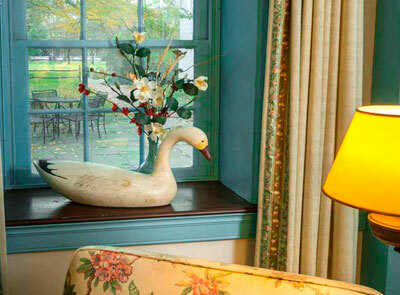 Not far from the great Eastern cities of Baltimore, Washington, and Philadelphia, the White Swan Tavern is a quiet and elegant inn nestled within the rich historical tapestry of Maryland's Chesapeake Bay region. Though conveniently located in the center of downtown Chestertown, within walking distance of the shops and restaurants, the Chester River waterfront, and the weekly Saturday farmer's market, the White Swan offers solitude and privacy for its guests, from the choice of having continental breakfast in your room to offstreet parking facing our spacious yard. Today the inn offers sleeping accommodations and afternoon tea from 3 to 5 p.m., as well as amenities suited for small conferences, weddings, and receptions. Just as it was described in the 18th century, the White Swan remains "a comfortable... Public House... with every attention given to render comfort and pleasure to such as favor it with their patronage." CLICK HERE FOR UPCOMING CHESTERTOWN EVENTS! "A lovely place. Everything we had hoped for. Great accommodations. "This tavern is a gem! My son and I were welcomed with an elegant afternoon tea in a colonial-era room. Peace, tranquility, warm and welcoming." "Great stay! Very charming afternoon tea and an amazing staff - very friendly!" "Thank you for such a wonderful stay. I felt right at home when I first walked through the door. Hope to be back soon!" "My wife and I wish to express to you and the others at The White Swan Tavern how very much we enjoyed our stay and how much we appreciated your generous hospitality. The Tavern is truly a jewel!" "My wife and I stayed at the Tavern last night and are already planning when we can return. You did a serious, meticulous job of renovation. We want you to know that with us, as well as many others, you have people who appreciate all you have done." "Beautifully restored and filled with lovely furnishings, topped only by the hospitable staff! Can’t wait for our next visit … and to bring friends!" "Lovely time with great people. Same room as last time 20+ years ago. Love the dog footprint in brick hearth." "Our thanks to the staff and the owner for their commitment to maintaining a beautiful historic site!" "Thanks so much for your historic hospitality. We always enjoy staying here – believe it’s our 3rd time!" "As an operator of a Bed & Breakfast myself I was interested in the White Swan. Beautiful accommodations. Innkeeper who greeted us was cheerful and helpful. Something I always find the most important quality of a B&B." "Always wished I could time travel (backward) – White Swan & Chestertown may be as close as I get! An impeccable restoration and wonderful furniture collection (from someone who knows..)." "A wonderful stay and peaceful night. "Great atmosphere and décor! Warm reception & delicious afternoon tea." "Fantastic step back in time! Loved the décor and the service!" "Loved staying here. Very cozy and charming." "Thank you for sheltering two sailors from the storm." "As always… a favorite place to stay." Lovely setting in a lovely town."